A weak teenager, regularly bullied at college, stumbles upon the car of his dream which he buys immediately. The car, which has its own personality, will change the boy’s life dramatically. Christine is inspired from the great Stephen King’s novel of the same name. 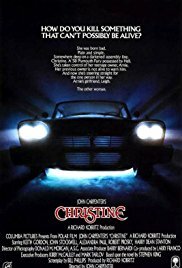 The concept of the story is very special and unique, making Christine one of the very few “car killer” movie (along with Maximum Overdrive). The story of the nerd kid having special something special and then becoming bad is a classic of horror and always a winner (Carrie, Ginger Snaps or more recently Chronicles), but here I found the college background a little boring, the all movie being way too “politically correct” to be truly good. This movie has its moments with lame scenes taken out of college movies alternating with cult horror shots. The way the car behaves, repairs itself (or herself) is brilliantly realized and some of the pursuits really cleverly put on screen. 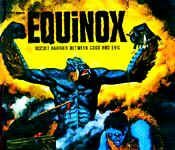 This could have made such a great film if it wasn’t for its lengthy moments and the irritating plays of the main characters. Still a good movie nevertheless. Funny fact: In the original King’s novel, the car had four doors, but this was changed to a two-door model when Carpenter realized that there never existed a four-door 1958 Plymouth Fury.